President Donald Trump says he's "open-minded" about stop-and-frisk policing. 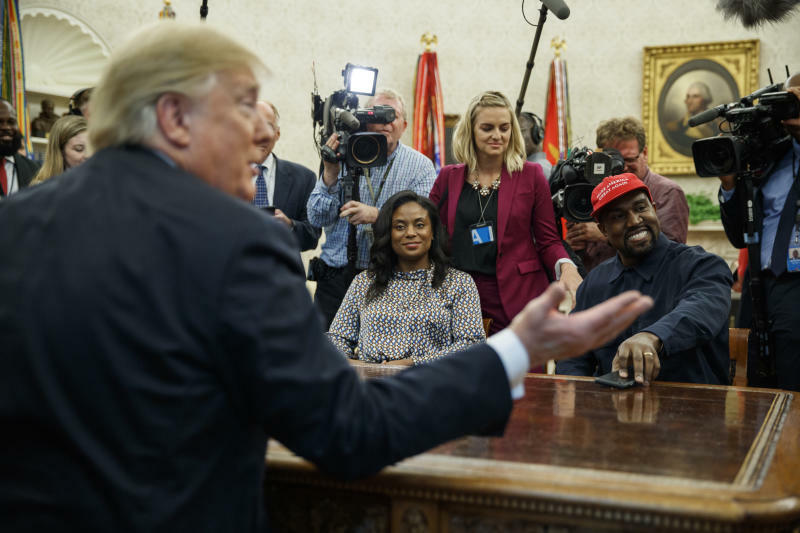 He made the comment as he met with rapper and producer Kanye West at the White House. Trump had said that "stop-and-frisk works." But West, who's from Chicago, tells Trump that this strategy is detrimental. Here's what West said: "We feel stop-and-frisk does not help relationships in the city." Trump says he'd been willing to "look at it," and says, "They have to do something." West credits Trump with stopping a potential war with North Korea and is encouraging Trump to swap his usual Air Force One jet for a hydrogen-powered plane. In a nearly 10-minute long speech in the Oval Office, West says he was pressured not to wear his red "Make America Great Again." West also says that many people believe that if someone's black, then that person has to be a Democrat. The White House had said that Trump and West would discuss a range of issues, including manufacturing, prison reform, preventing gang violence and reducing violence in Chicago, which is where West grew up. President Donald Trump is set for a White House lunch with rapper Kanye West, whom he calls a longtime friend. Trump told "Fox and Friends" Thursday: "He's a different kind of guy and that's OK with me." The White House has said they will talk about manufacturing, prison reform, preventing gang violence and reducing violence in Chicago, where West grew up. Also attending is former NFL great Jim Brown, a civil rights leader who has met with Trump previously.